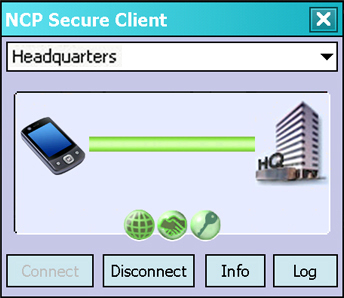 The NCP Secure Entry Client for Windows Mobile is a communication software product for universal implementation in any remote access VPN environment. Highly secure data connections to VPN gateways from all well-known suppliers can be established using IPsec standards. The data is transferred over any public wireless network, the Internet, as well as wireless networks such as wireless LANs within his corporate environment and at hotspots. For example mobile teleworkers can access central data repositories and applications via PDA, MDA, or TabletPC from any location. Another interesting area of application is mobile data acquisition, e.g. taking stock in the warehouse with PDAs via an integrated barcode reader and data transfer via WLAN. Universal implementation possibilities require security mechanisms that repel attacks in any remote access environment. Even at hotspots during the logon and logoff processes of the teleworker. In addition to VPN tunneling the most important integrated components are: data encryption, a dynamic personal firewall, support of OTP (One-Time Password tokens) and certificates in a PKI (Public Key Infrastructure). Use the Personal Firewall to define policies for: ports, IP addresses, and segments as well as applications. An additional safety criterion is "Friendly Net Detection" (location awareness), i.e. automatic detection of secure and non-secure networks. The appropriate firewall rules are activated or deactivated depending on whether a friendly net is detected. All configurations are always executed by the administrator - they cannot be changed by the user. "Easy-to-use" – simple installation and operation of the client software. Convenience is ensured by the integrated configuration wizard for the configuration PC and an intuitive graphic user interface on the mobile end device. The mobile user works in precisely the same manner as he does on his office workstation. Interruptions of a wireless connection while transferring data e.g. wireless failures, or when changing access points in the WLAN, have no effect on these transparent work methods. For E-mail push services a special connection mode ensures automatic re-establishment of the VPN tunnel to the central VPN gateway. Thus the teleworker can always be reached. Security Features The Entry Client supports all IPsec standards in accordance with RFC and also satisfies the most rigorous security requirements. Authentication Processes IKE (Aggressive mode and Main Mode), Quick Mode; XAUTH for extended user authentication; IKE config mode for dynamic assignment of a virtual address from the internal address pool (private IP); PFS; PAP, CHAP, MS CHAP V.2; IEEE 802.1x: EAP-MD5 (Extensible Authentication Protocol): Extended authentication relative to switches and access points (Layer 2); EAP-TLS (Extensible Authentication Protocol - Transport Layer Security): Extended authentication relative to switches and access points on the basis of certificates (Layer 2); support of certificates in a PKI: Soft certificates, smart cards; Pre-shared secrets, one-time passwords, and challenge response systems; RSA SecurID ready. Transmission Media WLAN (WiFi), GSM (incl. HSCSD), GPRS, UMTS; Internet; analog modems (mobile phones via infrared or Bluetooth). Download the NCP Secure Entry Client for Windows Mobile Datasheet (PDF).